Maine's Immigrants Boost Workforce Of Whitest, Oldest State In U.S. New immigrants are projected to be the main driver of the U.S. workforce over the next 20 years. That trend is already playing out in Maine, which has an aging white population with a low birth rate. A demographic crisis looms over Maine, the oldest and whitest state in the U.S. with one of the country's lowest birth rates. Employers are already feeling the effects on Maine's workforce as they struggle to fill positions with "old Mainers" — long-time residents in a state where many take pride in their deep family roots, especially along the shores of Washington County. Here in the rugged, eastern edges of the U.S., dotted with evergreens and wood-shingled houses, many make a living from the waters of Down East Maine, including Annie Sokoloski, an office manager in Steuben, Maine, for Lobster Trap, a wholesale lobster dealer. Working in seafood goes back generations in her family. "My grandmother forced me to go into the fish factory and pack sardines," says Sokoloski, who recalls working as a sardine packer while on break from school. "She told me anytime that I thought about not having an education I needed to remember that day." These days, Sokoloski says she still remembers other lessons: "You need to get away from here to make anything for yourself" she remembers her grandparents telling her when she was growing up. "I think to a certain degree I do it with my own daughter," she says. Her 23-year-old daughter, Natasha Davis, was also raised in Washington County. She wants to be a veterinary technician and has California in her sights. "There seems to be more job opportunity out of Maine," Davis says. It's young people like her that have been leaving Maine in droves since the 1980s. Local officials say they're worried about harder times ahead for Washington County, which faces the highest rate of unemployment of any county in Maine at 7 percent, according to the state's Department of Labor. "The situation is worse than it appears. We have a lot people who are at their prime earning years, in their 50s and early 60s, and they're beginning to retire," says Charles Rudelitch, executive director of the Sunrise County Economic Council, named after Washington County's nickname. He says he's worried about who will be around to replace those retiring workers. Nationally, the U.S. workforce is facing similar challenges with the decline of the baby boomer generation, according to a recent Pew Research Center report. It projects that new immigrants will be the main drivers of growth in the U.S. workforce through 2035. Large communities of mainly Somali and Sudanese refugees have formed in Maine's largest cities, Portland and Lewiston. Rudelitch says Washington County also needs more immigrants and other newcomers to help sustain the local economy. "We're making the argument that over time, there will be a much bigger economy for all of us to have a share of if we welcome people who choose to move here," he says. 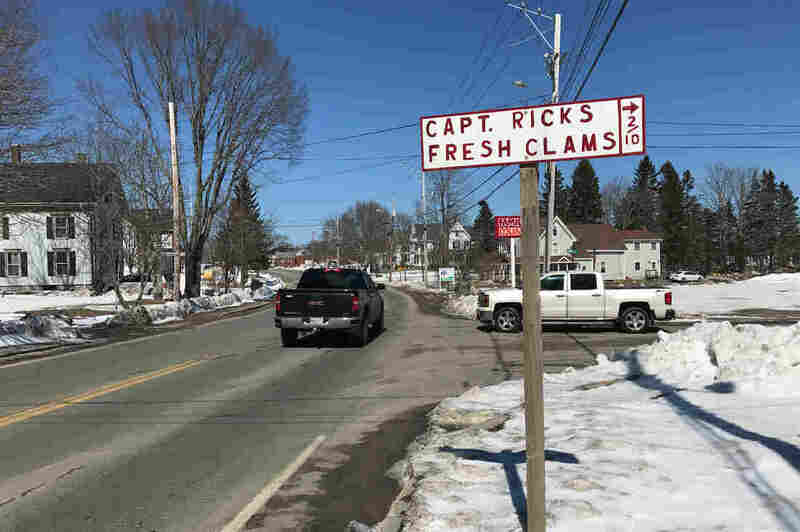 Newcomers have been moving to the county, specifically to the small town of Milbridge, with a population of just over 1,300, according to the 2010 Census. 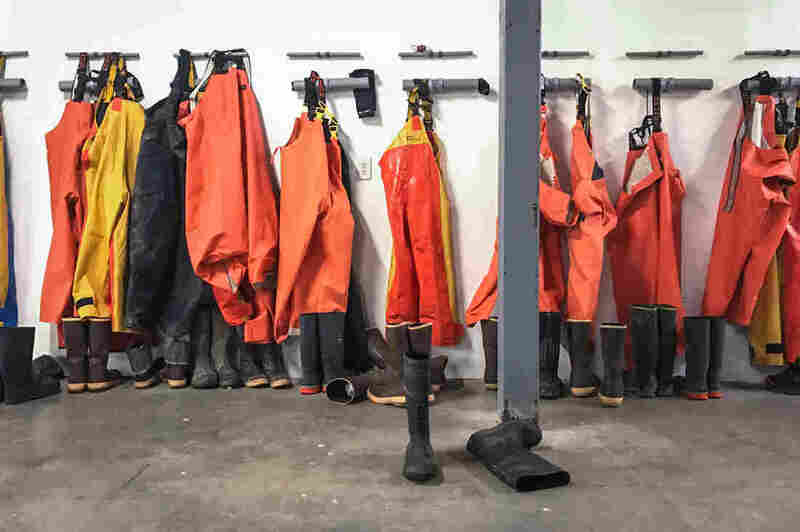 Workers' gear hangs inside Lobster Trap's facility in Steuben, Maine. While Latinos make up just over 1 percent of Maine's residents, about 6 percent of Milbridge's residents are Latino, many of them families drawn by jobs in lobster processing, blueberry picking and wreath making. Maria Paniagua Albor works in the office of a lobster processing plant, where she says most of the workers are Hispanic, either from Puerto Rico or Mexico. The white workers, she says, she can count on one hand. Her father was one of the first workers from Mexico who put their roots down in Milbridge. She says he worked seasonal jobs in the area for years before he decided to move his family after they received their green cards. 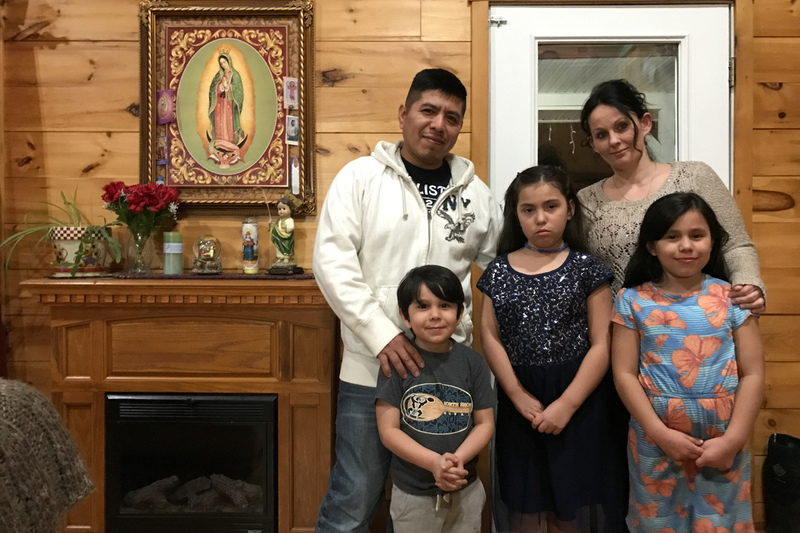 Now a U.S. citizen, Paniagua Albor lives in her own mobile home in Milbridge with her husband and two-year-old son. She often volunteers with a local immigrant advocacy organization, Mano en Mano. Maine, she says, is just like what the welcome signs say along the highways here: "The Way Life Should Be." "I don't want to be stuck in traffic like in New York," she says. "It's calm, and that's good to raise kids." Victor Flores, his fiancé Mary Robbins and their children Manny, Leyla and Miranda. Flores says he has felt some of the backlash against newcomers in Milbridge. Victor Flores is raising four children in Milbridge with his fiancée. They met when they were working at the same seafood plant. She was the bookkeeper, while he processed sea cucumbers. Flores' fiancée is white and has lived in the area for almost 30 years. He was born in Mexico and moved here from Florida almost two decades ago. Flores says he's felt some of the backlash against newcomers in town, including once outside the local supermarket when he parked next to a white man's car. "He thought I was too close to him, so he started getting mad. And the first thing, he's like, 'Go back to Mexico! Go back to where you came from! You don't belong here!' " Flores recalls. About a decade ago, tensions over new immigrants settling in Milbridge spilled over. There was a legal battle over building a small apartment complex for local farmworkers, most of whom are Hispanic, after voters approved a moratorium on multi-family units. The apartments were eventually built. 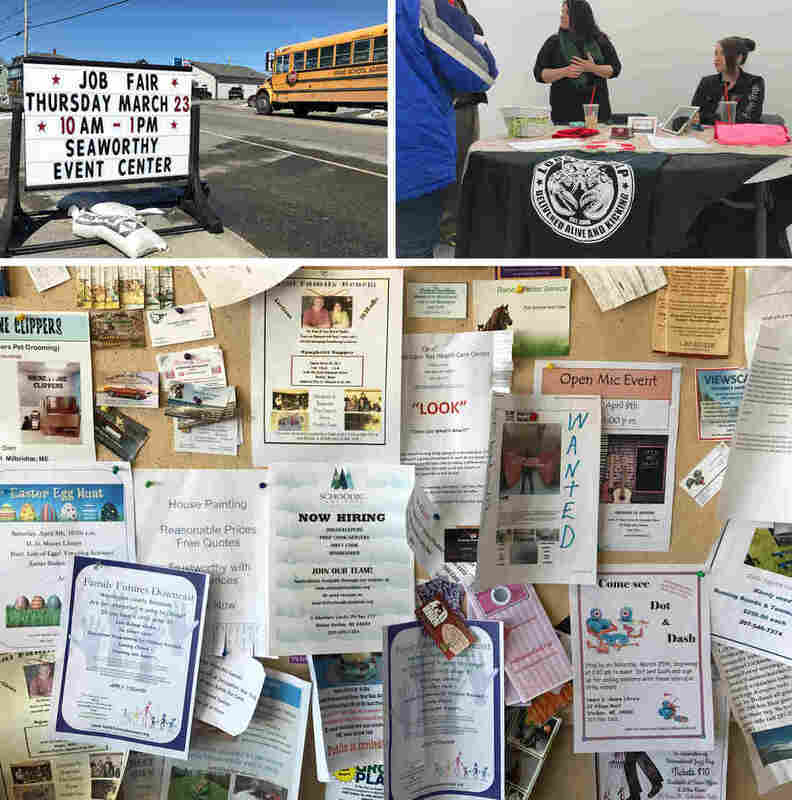 Sokoloski, the office manager from Lobster Trap, sees newcomers to Milbridge as a welcome addition, especially at job fairs and other recruiting events. Still, she says she is concerned about the future of Down East Maine's economy. "It's disheartening," she says. "It's going to be more of a retirement-type area. There's nothing to really sustain a long-term growth of a younger generation." She's not sure how long she'll live here year-round once her daughter leaves. After retirement, Sokoloski says, she'll probably move away.